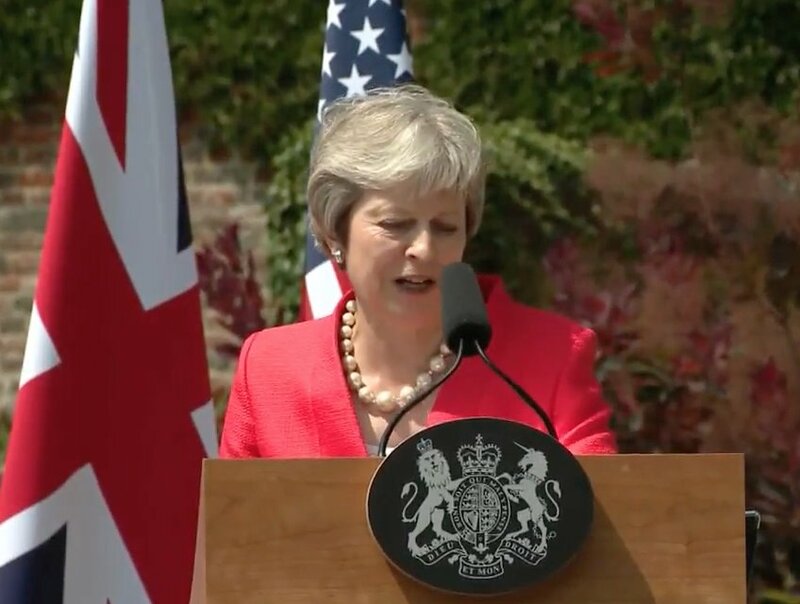 At Chequers @theresa_may, alongside @POTUS, says she thanked him for expelling 60 intelligence officers from #Russia following Salisbury nerve agent incident. Will pursue a US-UK free trade agreement following #Brexit, adds @theresa_may. US and UK in agreement on how to deal with #DPRK and #Iran and need for increased @NATO defense spending, declares @theresa_may. Last night's dinner at Blenheim Palace was "really something very special," says @POTUS. Traditions of freedom, sovereignty and rule of law are shared US and UK gift to the world, says @POTUS. 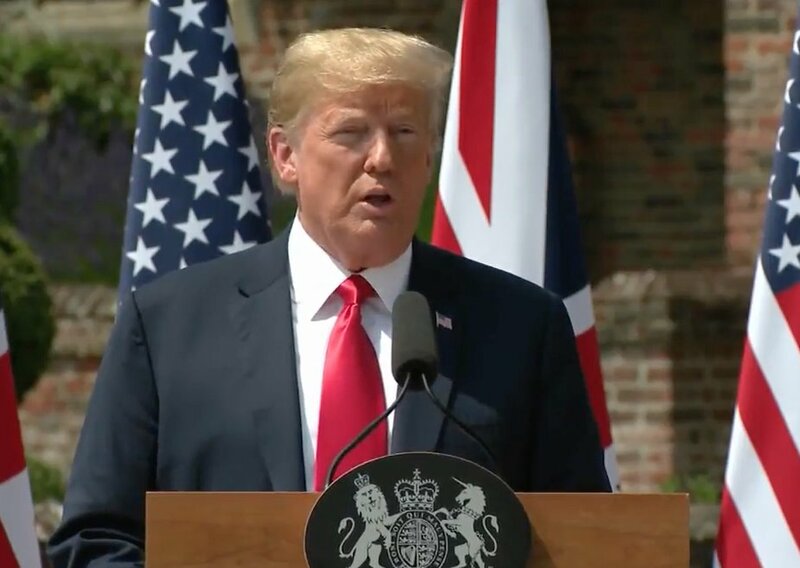 "Truly a productive summit" at @NATO, says @POTUS thanking @theresa_may for making #UK five out of the 29 members meeting spending commitments. Today discussed "stopping nuclear proliferation," says @POTUS, mentioning #DPRK and #Iran. 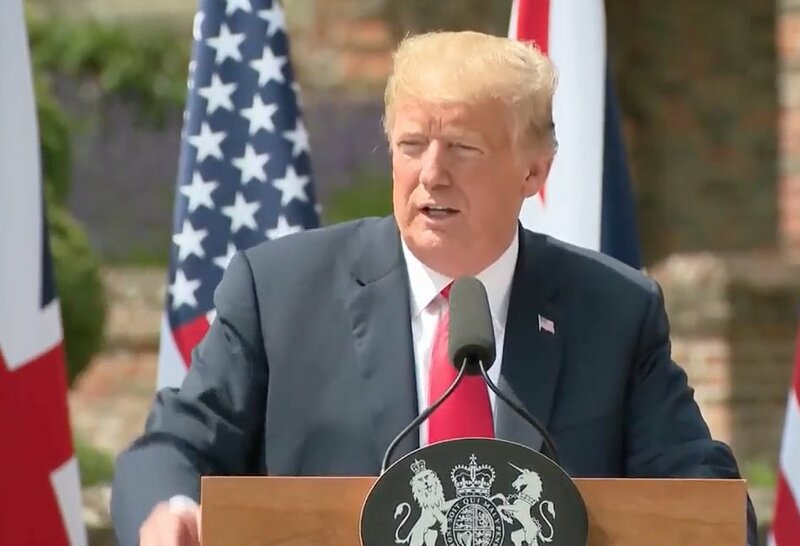 UK and US also strengthening cooperation between their armed forces "all around the world," says @POTUS. "We have threats far different than anything" previously, adds @POTUS. "Border security is a national security problem," says @POTUS. "I don't want they're going to do...but whatever you do is OK with us," says @POTUS of #Brexit. It's "not an easy negotiation, that's for sure," adds @POTUS about #Brexit. "We continue a long tradition, collaboration and affection," says @POTUS, calling his visit here "an honor." "I didn't criticize the prime minister," says of @TheSun interview and mentions "fake news," says the Q&A was recorded to verify what he did say. 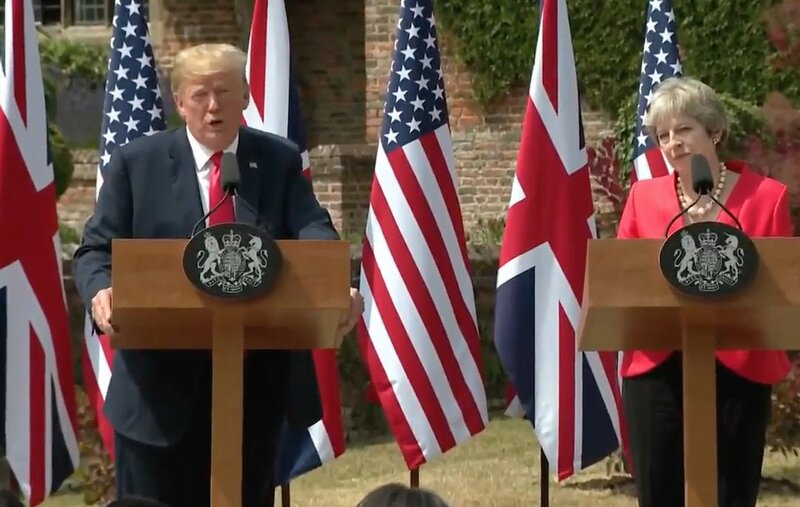 "It will absolutely be possible" to achieve a US-UK trade deal, says @POTUS. "I think she's doing a terrific job." #Brexit will mean #UK will be able to make such trade deals," says @theresa_may. #Syria, #Ukraine and nuclear proliferation among issues he'll discuss with Putin, says @POTUS. "I will absolutely, firmly ask the question" about election meddling to Putin, adds @POTUS. On US troops in #Germany, @POTUS seems to confirm at @NATO he mentioned possibility of a pullout but "it wasn't a threat." #Europe needs to tighten immigration policies, says @POTUS. "Such dishonest reporting," responds @POTUS to @NBCNews question about him criticizing @theresa_may. "We have been far tougher on Russia than anybody," says @POTUS. "Let me clear about this: We will be leaving the European Union," says @theresa_may. 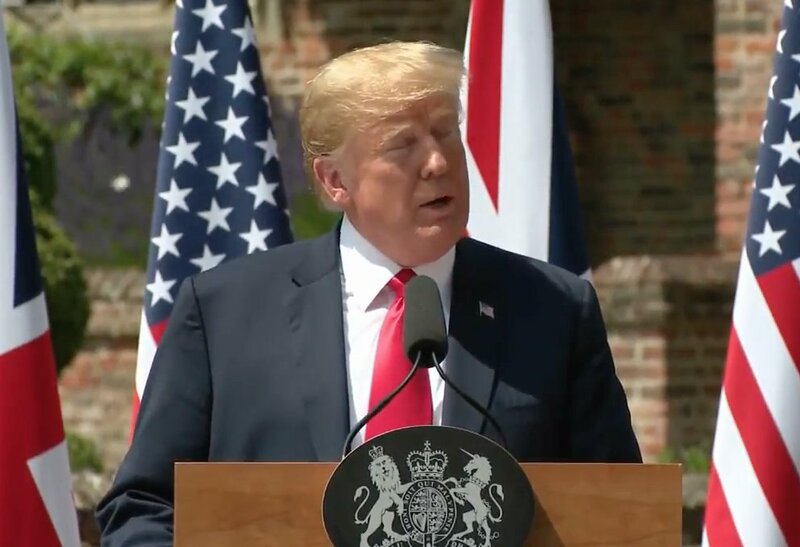 "He'll be a great prime minister," @POTUS says of @BorisJohnson. And "this incredible woman is doing a fantastic job." 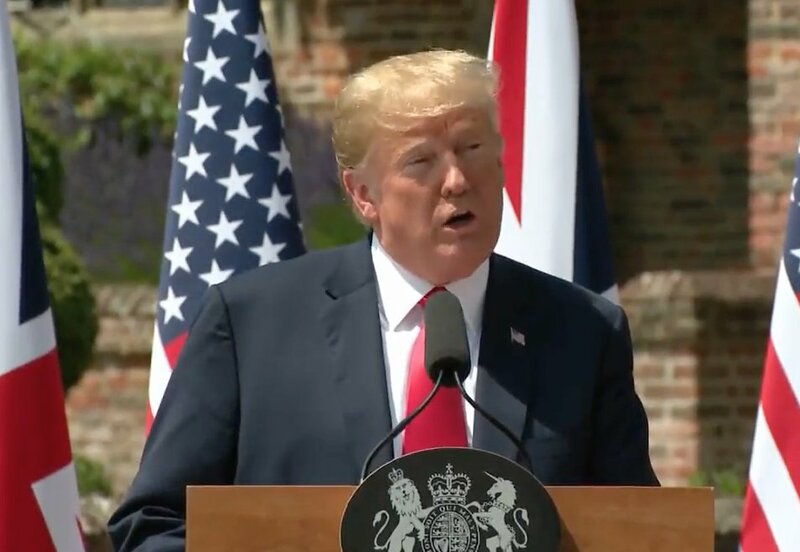 #EU on trade treats "the United States horribly," says @POTUS, complaining about car tariffs. 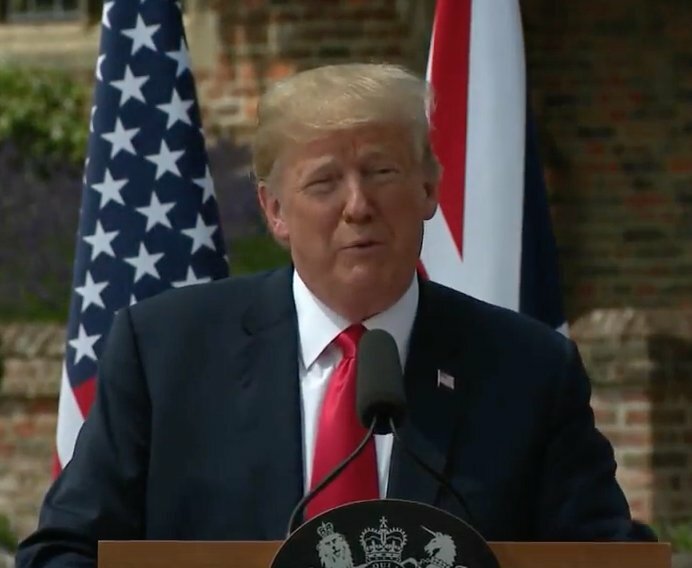 US-UK relationship is "the highest level of special," declares @POTUS. 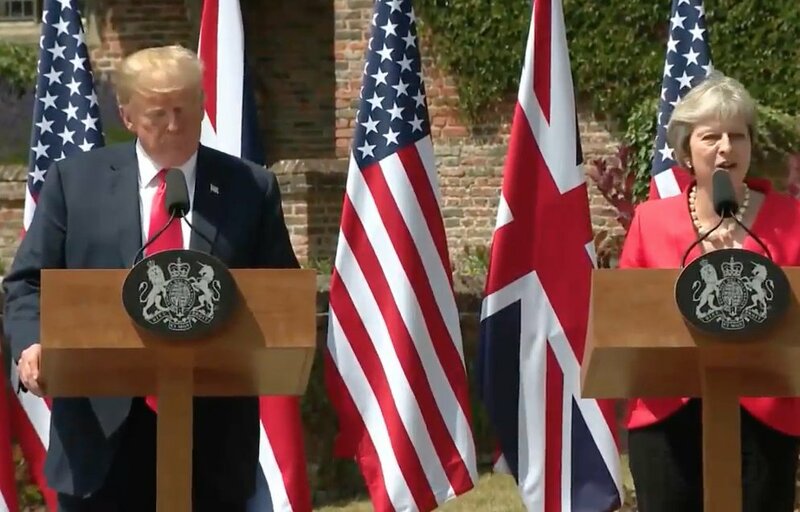 His advice on #Brexit to @theresa_may might have been "brutal" but @POTUS says he can't specifically remember what he recommended. "CNN is fake news. I don't take questions from them," says @POTUS. "Let go to John Roberts of Fox. "Rigged witch hunt...really hurts our country and I think really hurts our relationship with Russia," says @POTUS in response to @johnrobertsFox question. "I'm not bad at doing things," calling #Crimea "an Obama disaster," says @POTUS. "I've taken over a lot of bad hands and I'm fixing them one by one," adds @POTUS. "I welcome the meeting with President Putin" but important @POTUS goes into it "from a position of strength," says @theresa_may. 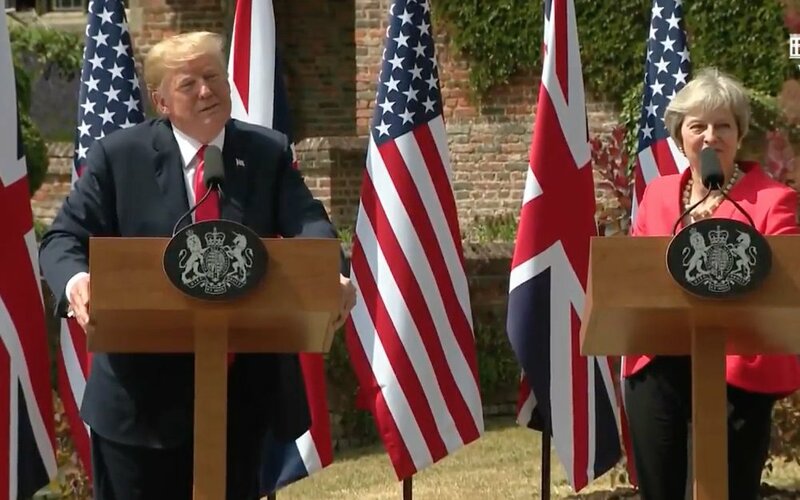 "At some point she can do what I suggested" on #Brexit, says @POTUS. "She's a tough negotiator." 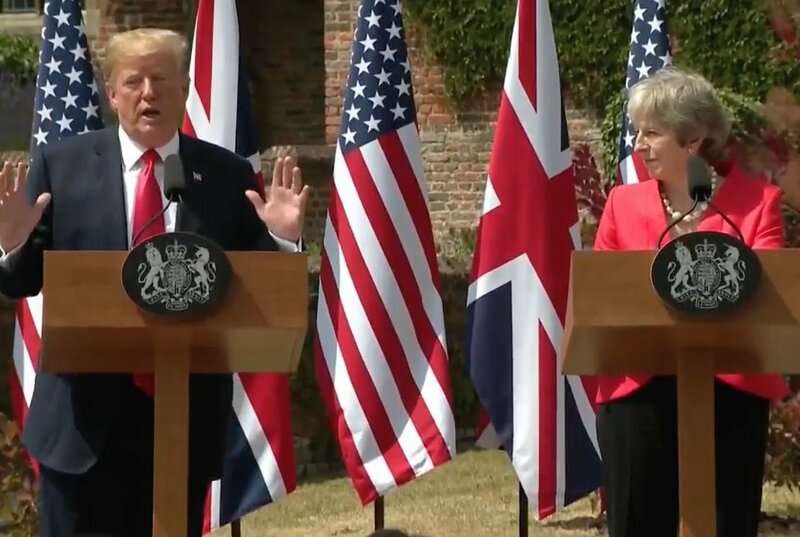 "I would much rather have her as my friend than my enemy," says @POTUS of @theresa_may. Nuclear proliferation "is the biggest problem in the world," @POTUS says, adding he understands #nuclear because he used to speak about it with his uncle who was a physicist at @MIT. "I'm not going in with high expectations but we might come up with some very surprising things," @POTUS says of his summit set for Monday with #Russia President Putin. "Our Brexit plan will deliver on what British people voted for," emphasizes @theresa_may. "They didn't put in the headline. I wish they put in the headline," says @POTUS of his praise of @theresa_may in @TheSun interview. "I think it's a horrible thing that you have a pipeline coming from Russia" to #Germany, says @POTUS repeating criticism of #NordStream2. President Trump literally in Winston Churchill’s seat. 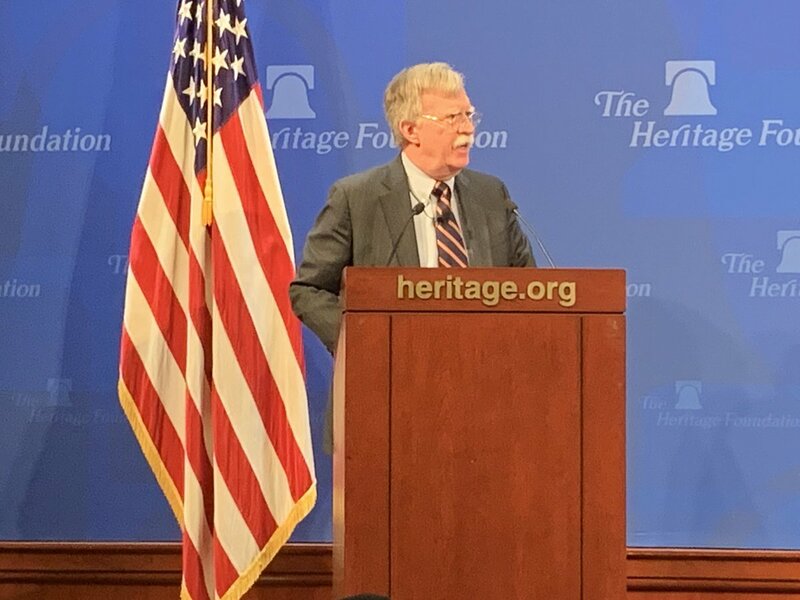 New @realDonaldTrump administration’s #Africa strategy being unveiled here by @AmbJohnBolton. The new #Africa strategy was approved by @POTUS yesterday and the administration "will begin executing (it) immediately," says @AmbJohnBolton. "We will no longer support unproductive, unsuccessful and unaccountable UN peacekeeping missions," announces @AmbJohnBolton. 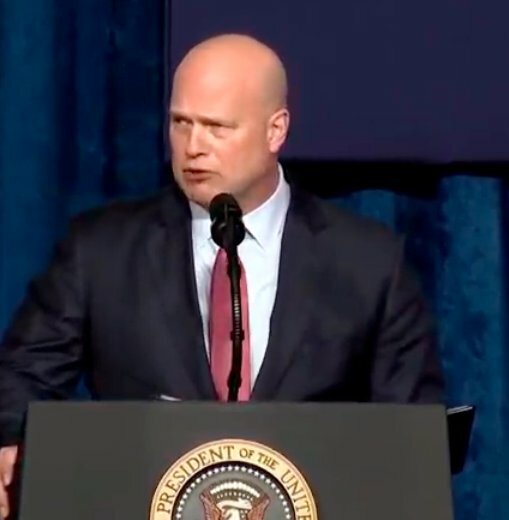 Selection by @POTUS to select Bill Bar as the next attorney general is "a continuation of this law and order presidency," says acting Attorney General @MattWhitaker46. 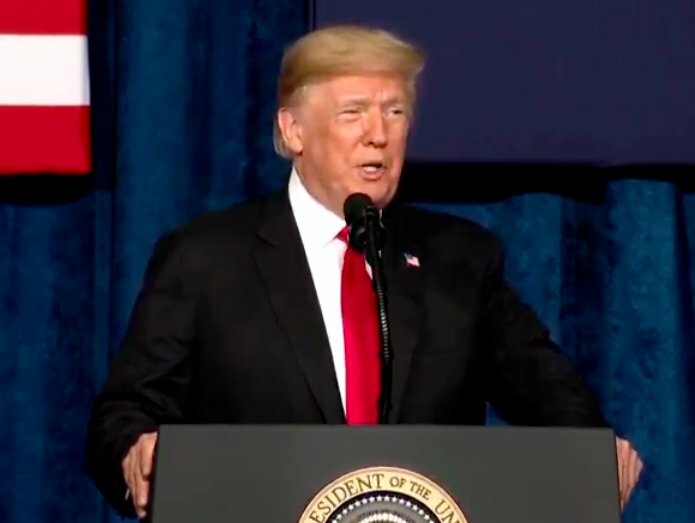 Barr demonstrated "an unwavering adherence to the rule of law" in his previous tenure as attorney general, says @POTUS in Kansas City speech to law enforcement, saying his intended nominee deserves bipartisan support. In speech to law enforcement, commenting on congressional races, @POTUS sometimes you choose someone for a position that you think is going to be really good and "they choke like dogs." The @POTUS-Xi dinner here was a “highly successful meeting," says @PressSec in statement and the Chinese president, "in a wonderful humanitarian gesture, has agreed to designate Fentanyl as a Controlled Substance." And @POTUS agreed that on Jan. 1, he'll "leave tariffs on $200 billion worth of product at the 10% rate, and not raise it to 25% at this time," adds @PressSec. "China will agree to purchase a not yet agreed upon, but very substantial, amount of agricultural, energy, industrial, and other product from the United States to reduce the trade imbalance between our two countries," according to @PressSec.
.@metpoliceuk tells @NBCNews: Officers from the counter terrorism network are working jointly with colleagues from Wiltshire Police regarding the incident in Amesbury. As Wiltshire Police have stated, they are keeping an open mind as to the circumstances surrounding the incident. Amesbury is about 10 miles from Salisbury, where former Russian spy Sergei #Skripal and his daughter Yulia were poisoned with the nerve agent Novichok in March. I’m at a committee room where the Russian ambassador to the UK, Alexander Yakovenko, is giving evidence to the all-party parliamentary group on Russia. Expect some interesting theories on nerve agent attacks, dissident deaths and Syria. Yakovenko begins by saying the UK is violating the Vienna convention by not allowing Russia direct access to Sergei and Yulia Skripal. “This is just a fact,” he says. Yakovenko, under questioning from Chris Bryant, who chairs the all-party committee, is now explaining the Russian theory that a nerve agent found in Salisbury was British made. I’m not sure I follow his answer completely.